Just to set those things straight, I am a firm believer in magic- I mean, how could the world of Hogwarts and Diagon Alley, and the Burrow not be real? I have pictured it to be real since the long days I spent in the garden, wishing I had a wand that would pull up the weeds for me while I awaited my Hogwarts letter. But the other things I look at merely for a source of entertainment. I would love to learn about tarot card readings just because it’s fun, I would love to have my palm read, just to see how accurate it is. But as far as those things and ghosts go, I’m not really convinced… as some people would say- I’m not completely crazy. This all kept in mind, I would love to tell you about some stories I heard during my night in the cemetery. At the start of Spring break, Liz and I decided to take a trip around the south island. After a ferry ride and a couple bus stops we ended up in a city called Dunedin. It was as hilly and as lively as San Francisco on a sunny day. Ironically- we stayed at a hostel called Hogwartz. One of the things that Liz wanted to do most was go on a ghost walk- a walk throughout the city while a guide showed you sites and told you stories of ghost activity. Even though I’m not superstitious- the idea was still a little creepy, but of course I went. A strange man in a cape and a top hat greeted us at the top of this hill and off we went. Overall, the walk was interesting, we ended up in a basement that happened to be very underground, called (even more ironically) “the chamber of Secrets”. This chamber was apparently known to be haunted due to its scary past, and is now where the citizens of Dunedin go to hold Pagan rituals…even though I had paid this man, I was questioning some of my decisions about who I trust to take me to dark rooms and tell me ghost stories. After the tour was over, the guide apparently liked us so much that he wanted to take us on a walk around a cemetery in the middle of the night- this cemetery supposedly made it to the top 10 most haunted cemeteries in the world. Naturally, we could not think of any reason we should not go. Needless to say, it happened to be much creepier than our ghost walk of the city, and the stories much more convincing. When we arrived, the guide started by telling us that despite the fact that he knew the cemetery like the back of his hand and he spent about 3 nights a week walking among the headstones, he would never ever go to the cemetery alone. Sitting in front of a computer screen it sounds like a good scare tactic- but honestly- I wouldn’t go back to that cemetery alone either- the air itself seemed….lifeless. Liz and I linked arms and didn’t let go until we were back to safety. Next he told us that if he says “let’s get out of here”…don’t hesitate- just run. Now, conveniently, as you walk through the cemetery, he does not tell the group where you are headed or any stories about the next site until you are there. In this case, we were headed to the “haunted corner”. It’s this really hidden place in the cemetery-you have to walk down a hill and around a thin trail to get there. It’s as dark as dark can get because the stars are not visible there and the moon is stuck on the other side of the hill. One night he took a group out there, and they did not finish the tour because something truly frightening happened. This is where the “run” comes in. The guide was leading the group to this dark, haunted corner, and at the top of the hill, a woman in the group started frantically screaming without reason, without warning. She said they had to stop, that they had to get out of the cemetery, that “it” was coming. The guide, who was slightly ahead of the group, walked back up the hill and tried to calm her down- not knowing what she was talking about or why she was screaming, or what she thought was going to happen. She did not relax. She screamed again and said that they could not go down there- that they were in danger, and that they had to leave. By then, the whole group was getting a bit antsy. What was this lady talking about? And why did everything suddenly get a little creepier, a little darker, a little stiller, even a little colder? Aside from the women in hysterics, the group was quiet- ultimately speechless, trying to figure this woman out. That’s when our guide claimed he heard it. There was a rustling of leaves that seemed to be coming from down the hill, from this haunted corner. It seemed to sound like footsteps. The guide slowly turned around, and whether it was that he was imagining things because this was the creepiest situation he had ever been in, or if it was a trick of light- he saw something coming up the hill. He jumped to his feet and yelled “Run!” and the entire group bolted to the gates in a terrorized rush because the guide wasn’t the only one who heard it or the only one that saw it. When they got to the gates the woman finally calmed down and was able to explain what happened. The important thing to remember about this story is that the guide does not tell you where you are or what you are doing until you are actually in the haunted corner. This woman could not have known what they were heading to. The woman explained first, that she was half Moari. She was on the tour for her birthday, and when they got to the top of the hill she claims and ancestor was coming up the hill to stop them. That he was angry that she was there, and that he was going to make it impossible for them to see the burial site, one way or another. The guide never said they were headed to a Moari burial site. At this point, the guide told us that we could take the story for whatever value we wanted, that several people in that group asked if he had paid this woman to put on a show, but it happened 100% as he told it. It was the scariest night of his life, and he questioned whether he should continue taking tours there. The “haunted corner” which is supposed to be the scariest part and most haunted spot of the entire cemetery, is a Moari burial site. It was there that a bunch of the native Moari people thrown without ceremony or burial when they died after the Europeans came to colonize. This was a huge insult to the Moari people because anywhere their dead were buried was to be considered sacred and not to be disturbed- it was even worse that they were not covered, but all placed in open graves. The Europeans had effectively insulted the entire Moari people by not only disrespecting their dead but by disregarding culture and customs of the people. According to the guide, it is much scarier during the day because you can see the open grave sites and you can see why the souls that are stuck there are restless. They have no idea how many people were buried there. Whether what happened was real or not, it was enough to give me the heebee geebies, and I was about ready to hightail it out of there. I didn’t want to disrespect anyone, or cause any harm to restless souls. I am totally happy to leave everyone in peace. Why did I even think it was a good idea to come here? But we couldn’t leave before he told us one more story. A long time ago, a woman was put on trial for stabbing and murdering her husband. In the trial, she explained that he was extremely abusive her whole life, and she could not handle it anymore. She needed to escape, so she killed him. This woman was 60 years old, had put up with endless suffering at the hand of her husband, and then was sentenced to life in prison. Back then, there was no separation of men and women in prison, and life in prison for a woman was virtually a death sentence. Her husband was buried in this cemetery- a real honor because only those who were of high class were permitted to be buried there. Remarkably, the woman survived for ten years in prison before she died. But, when her time came, the officials decided to bury her next to her husband in the cemetery because that was the custom (despite the fact that she had committed a crime, declared her hatred against her grave partner, and had been the one that killed him). Soon after she was buried next to her abusive husband, a visitor came back to visit her grave. It was cracked open. I could not help but be proud of this woman. At the end of the tour, the night seemed a little crisper- and pictures I needed to prove I was there reached a questionable necessity. The hairs on the back of my neck were standing straight up. I don’t believe in ghosts, but it was hard in the middle of the night in the pitch dark not to think that the breeze blowing in your hair might be a little more. That the crackle of your footsteps might not just be from your footsteps, and that these stories might have some truth to them. 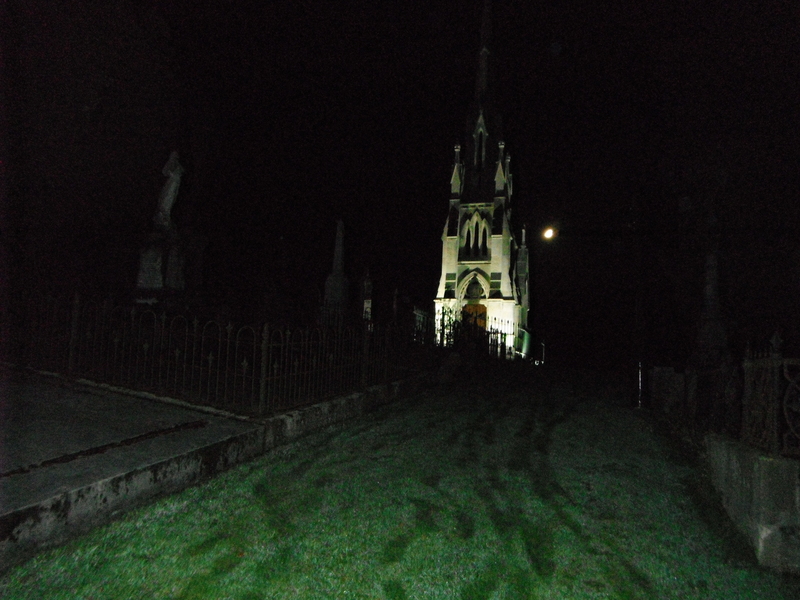 Spend a night in a cemetery if you have the chance, and see what you come out believing. My friend alyssa’s encounter with a ghost our freshman year! Outstanding post. You are drawn to all things supernatural (e.g. voodoo in Africa). Sounds like a very fun adventure.